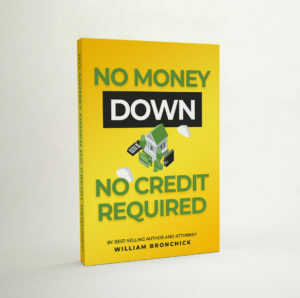 Nothing down does not always mean no cash to the seller. Here are 12 creative ways to buy for cash with no cash out of your pocket. 1. Find the deal, tie it up with a contract containing a weasel clause and assign your rights under contract to another investor for cash. 2. Find the deal, tie it up, and get a partner to put up the money. You do all the work and you and your partner share 50/50. 3. Find the deal, tie it up, arrange for a long closing, find a buyer, and do a simultaneous closing. 5. Find a motivated seller with no equity. They will give you the keys. Find someone to take over your deal for a few thousand. People who don’t have to qualify will pay 10% more than market value to get a house. 6. Find a motivated seller with a free and clear property. Trade your fix-up skills for the down payment and get the owner to hold the balance. 7. Find a motivated seller with a free and clear property who needs some but not all cash. Borrow the money needed for the down payment from a hard money lender. Most hard money lenders will lend you 50% loan to value with no credit or qualifying. Make the owner accept a second mortgage for the balance. Be sure not to mention interest unless they do. 8. Find a motivated seller who has a house in need of fix up and is behind on credit card payments. Instead of giving them cash, offer to pay off the credit cards. You can then negotiate a discount on these amounts. Use your credit cards to pay off these debts. 9. Find out what the seller needs the money for. It may be something you can charge on your credit cards. 10. Control the property with a lease/option: Sublease the property to cover the payments and then sell your option or do a simultaneous closing. 11. If you have to put up a down payment, and the owner is holding the mortgage, call the money advance payments. That way you won’t have to come out of pocket for a while. 12. Get a straight option from the seller at a discounted price and then re-sell. Tell the seller they can even list with a realtor, just exclude you from the listing agreement. Do you get the message that you need a MOTIVATED seller? Usually, this creativity will not work with a realtor. You need to deal with the homeowners directly.